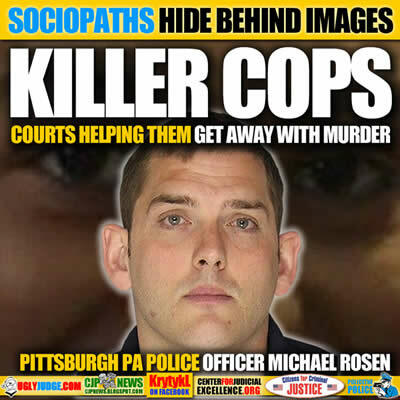 East Pittsburgh Police Officer Michael Rosfeld MURDERED 17-year old Antwon Rose Jr.
Americans MUST accept these types of monsters get hired or put in place on a daily basis as Police, Judges, Prosecutors, DA’s, lawyers and government. It’s a broken system that looks the other way in order for psychopaths, sociopaths, killers, control freaks, liars and con-artists to get hired and move their way up the ladder. When victims come forward they’re made into the villian and terrorized, abused and victimized by a system based on greed, profit and dishonesty. Dishonorable judges mean NO JUSTICE in our courts always blaming it on law which lawyers and judges create in order to escape any accountability or prosecution. Perjury, ignoring crime and law is common among judges and courts today when it comes to profit and bribary. Thousands of victims every year go to court at insane overpriced costs only to find out there is no justice due to a judge that ignores evidence, facts and law. East Pittsburgh Police Officer Michael Rosfeld is charged with one count of criminal homicide in the shooting death of 17-year-old Antwon Rose Jr. But the real problem will be holding him accountable and prosecuting him fairly and equally. Immunity in the hands of monsters like this ultimately means he’ll escape justice and get away with murder. The charge against East Pittsburgh Officer Michael Rosfeld is outlined in a criminal complaint that says the officer first told investigators that 17-year-old Antwon Rose Jr. turned his hand toward him when he ran from the car and he “saw something dark he perceived as a gun.” During a second recap of the shooting, Rosfeld told investigators he did not see a gun and he was not sure if the teen’s arm was pointed at him when he fired. You can’t take someone’s life under these circumstances,” Allegheny County District Attorney Stephen Zappala said at a news conference. Manko said that criminal homicide can include any instance where someone knowingly, intentionally, recklessly or negligently causes the death of another person, and includes the charges of murder, voluntary and involuntary manslaughter.